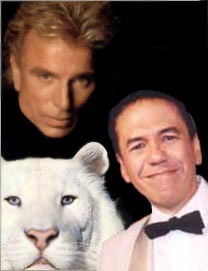 Due to the tragic tiger attack on magician Roy Horn of the legendary duo "Siegfried & Roy", the show has been indefinitely canceled. The attack happened within days of another tiger attack in Harlem, but the incidents are unrelated. 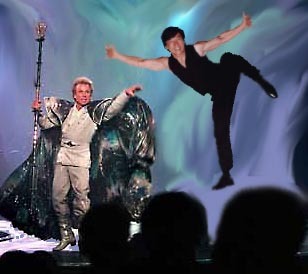 Being a professional showbusinessman, Roy would undoubtedly want the show to go on. Hundreds of Las Vegans will be out of the job if the show doesn't go on, and no one would want that. 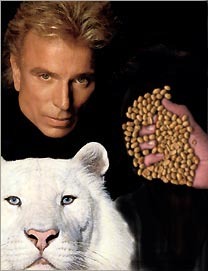 Many fans of Siegfried & Roy are unaware that Siegfried has partnered with many people over the years. 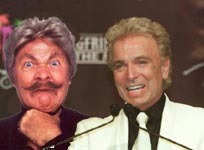 His first partner started with Siegfried in Atlantic City, while simultaneously maintaining his own solo television career. 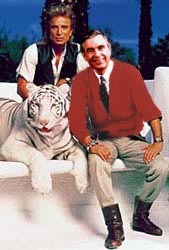 Mr. Rogers was a fearless man with a calm demeanor (which kept the big cats in line), and he always looked good in a sweater. 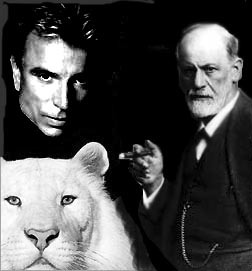 Just check out his steely gaze as he handles Daniel, the lion, below. 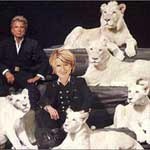 And, look at him sitting inches away from a real live ferocious gorill-ill-ill-ill-la. It'd kill him in an instant for a banana flavored Tic Tac. 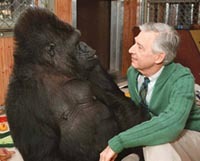 But Mr. Rogers wasn't nervous. Maybe he was on drugs. 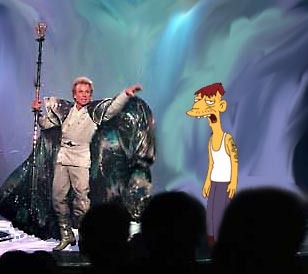 When Mr. Rogers left the show due to artistic differences, Siegfried wanted to find someone whose name also began with R, to avoid the high cost of re-monogramming all of the towels. With so many animals back stage, you need a lot of towels. 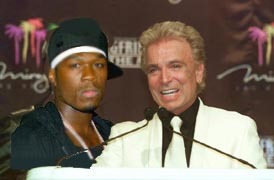 Then fortune smiled when a legendary performer turned up for the audition. 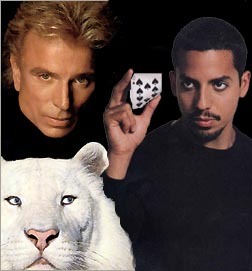 This was the beginning of the Siegfried and Roy legacy. Originally, Roy Rogers got the job because not only did his name start with R, but it was the same name! They could keep their stationary and big billboards exactly as they were. The only change was to paint on a cowboy hat. 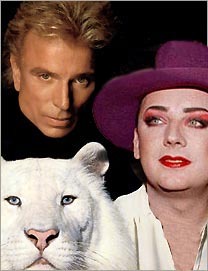 However, Siegfried never liked the name "Siegfried and Rogers". People kept calling them "Rogers and Hammerstein" and singing "Oklahoma" to him on the street. 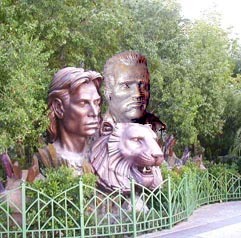 They changed the name to Siegfried & Roy, and things went well. Well, that is, until Roy left the act to open a chain of fast food restaurants. 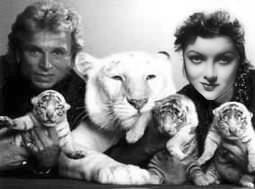 Siegfried was becoming a household name by this point, and after an all-night negotiation in a Kentucky meat packing plant, Siegfried recruited the second Roy, also known for his country flare. All good things must come to an end, and eventually Roy #2 left to join the cast of "Hee-Haw". 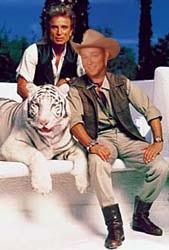 A little-known fact: Roy Clark tried to take the animals with him to "Hee-Haw", but after a white Bengal relieved itself in Minnie Pearl's hat, it was returned to Siegfried (the tiger, not the hat). 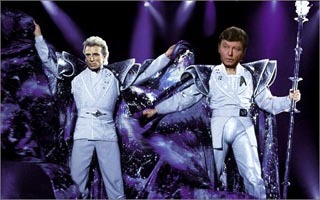 After Roy Clark left the duo, Siegfried was left looking for another partner. Due to a severe Roy shortage, he decided to expand his search to people whose names rhyme with Roy. 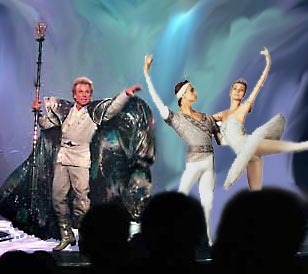 At this point, Siegfried decided there was no need to lock himself into partnerships based on one rhyme. So he looked for partners that sounded good with his own name. 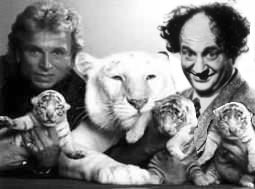 Siegfried felt for a while that using his full name was too formal, so he looked for partners based on his nickname, "Siggi". Perhaps that isn't really his nickname, but it should be if it isn't. Eventually, Siegfried found the perfect partner in Roy Horn and everything was perfect (and he could re-use his old business cards!). 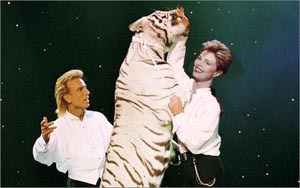 Over the years, when Roy would have to miss an occasional show due to family obligations or teeth cleaning appointments, celebrities would do guest appearances. 1) Replace the real tigers with Tiger Woods. 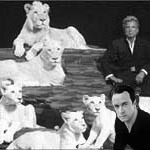 2) Have Marlon Brando play the part of the lion. 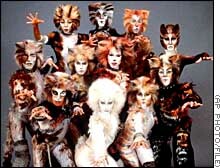 3) Use the cast of "Cats" for the rest of the animals. Hopefully this historical resource will be helpful to the producers while Roy recovers. Check out the Masked Reviewer's DVD reviews too.